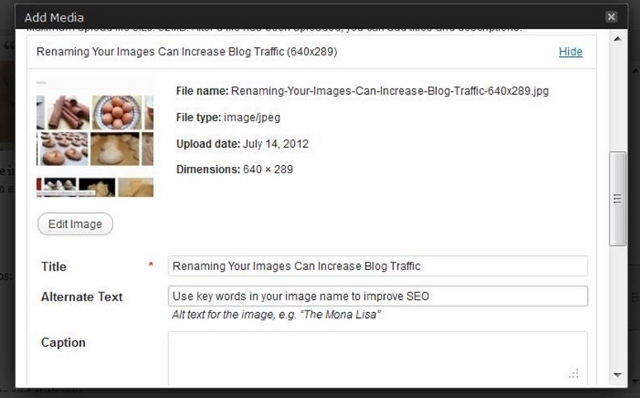 Last week I told you how you can increase traffic by renaming your photos with key words. I know some of you are thinking “But I have over 100 posts with unnamed photos. How am I ever going to name them all?” Just thinking about it can be overwhelming. So instead of dealing with all those unnamed images, you decide to make the world a happier place by creating a recipe for German Chocolate Brownies. I might know something about procrastination. Which is why I developed my own system for how and when to update image names. Some might call it lazy, and if you didn’t know better you might think it was a random and disorganized approach. But I like to think of it as a deliberate and strategic plan for naming old images. That’s my story and I’m sticking with it. Don’t create any more old, unnamed images. Make a commitment to name all of the new images you upload so you do not create more work for yourself. It takes less time to do it correctly now, than it does to go back and fix it later. Update images in posts as they become relevant. I did not start with my oldest post and systematically update each image. I rename images as they become timely and in season. There is no reason to update posts on Christmas in August. Instead update your images on recipes for seasonal produce, canning, making jam, drying herbs, picnic inspiration, etc. In other words rename the photos in posts that are on subjects people are searching for now. Update images before they become relevant. People start searching on some recipes and topics a few weeks to a month ahead of time. I use Pinterest to help me gauge when people start searching on different topics. When I see a trend emerge, I search for posts I have on that topic and update the photo names. Update Images as you link to old posts. When I link to an old post, I take the time to make sure the post I am linking to has named photos. I also check to see if the images have names before, I share an old post on Facebook. You can do a quick check, by running your mouse over your photo and see what name pops up in the box. When short on time, just rename the first image or the best image. When time is short and I am faced with an old post with lots of pictures, I just rename 1 or 2 images instead of all of them. Hopefully your first image is your best image, if not, try to find the time to name them both. This system means that there are still unnamed images on my blog, but I am not worried about it. If I feel those old posts become topical, I will update them. If you use Blogger, you can go back and add a title and alternate text to your image. 1. Open your old Blogger post in Edit mode. 2. Click on your picture and a tool bar will appear below your picture. 4. Then fill in the Title and Alternate Text fields. 5. Press OK to save changes. Repeat for other images in the post. 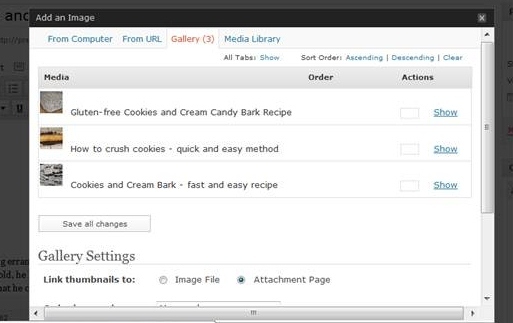 If you use WordPress, you can go in and add titles and alternate text to multiple images easily. 1. Click on Edit Post. 2. Click on Add Image. 3. Click on Gallery. The Gallery will open with all of the images from that post. 4. Click on Show for the image you want to edit. 5. Fill out the Title and Alternate Text fields. 6. Click Show on the next image you wish to update and repeat step 5. 7. Scroll down to below the last image and click the Save All Changes button (it is just above the Gallery Settings). As I stated in my post on How to Increase Blog Traffic by Naming Your Images, you don’t want to overuse key words or stuff your images full of key words; just use the title and alternate text fields to share what is truly relevant to those doing a Google Image Search. Do you have a different strategy for renaming old photos? Let me know in the comments and/or come share it with us on Blogging for Foodies Facebook Page! I love the tip about Pinterest. I don’t spend nearly enough time on there and I should. Many of my images are on Flickr, with the really old ones still on whatever Blogger uses for storing images. Whenever I link to old posts, especially recipes, I always try to reformat them for printing. I never thought of editing the images which would help my SEO, too. Thank you for this good advice. I haven’t been naming my pictures and last night, looking back at all those untitled files was feeling pretty overwhelming. This is a smart way to approach all that work.